This page provides brief descriptions and photos from recent club events. The Hawthorne room was the venue for the MMOC Xmas dinner at the Solway Park complex in Masterton on Sunday 8th Dec. The tables were set out well with streamers and crackers by the Solway staff and a large Christmas tree with decorations in the corner. Club members enjoyed a very scrumptious lunch and then the arrival of father Xmas (alias Steve Reid). 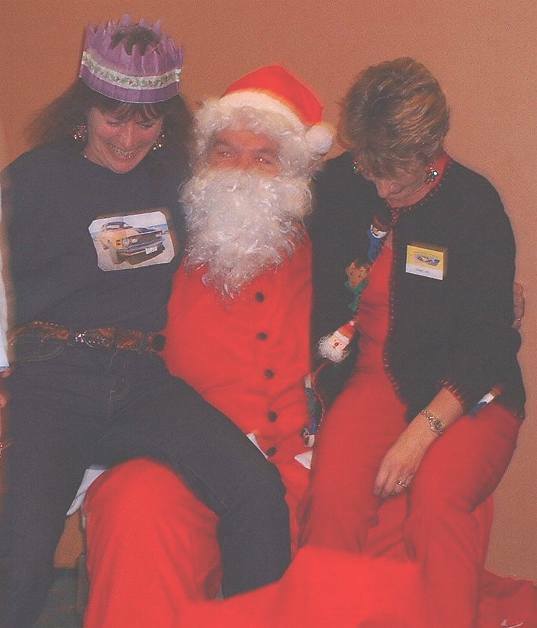 But why did the ladies have to go and sit on his knee? For everyone else he handed the presents out by wandering around the members. The day wasnt that good weather wise, so there wasnt many mustangs in attendance with people choosing to come along in their daily drivers. Held on Saturday 16 to avoid a clash with the Upper Hutt Street Drags (actually rained off), this meeting was a combined scavenger hunt, poker run and rally. Brilliantly put together and run by the Bettridges, President James and Bev, Ross and JB, the outing had many elements, a lot of fun and a couple of near-divorces as some lost their way. It was raining at most of the points of origin and forecast to get worse. Despite dark mutterings about not going because cars and the insides of their boots would get wet, Mustangers are a hardy bunch and 19 cars gathered at the Palmy North railway station. After being handed a large plastic bag and a list, we started the scavenging part – feeling not a little silly scrabbling round in gutters and amusing train passengers. Since the required items included a used train ticket and various bottle tops, it did seem like the best place to start. We also had to find something starting with each letter in the word MUSTANG – station plants took a bit of a hammering and a couple of botany-inclined club members even found something starting with ‘u’ (known to everyone else as gorse and elm), thinking they were clever until someone pointed out that USA starts with ‘u’ and our club logo includes a USA flag! The next task was to pick up directions and the first poker card, then set off to, a) get to the right place at the end, and b) answer the questions posed along the way. The first instruction was to turn left at the traffic lights – one car was seen going straight ahead; not a good start and what did they do later on when instructed to “ turn the same direction you did at the very start”? And to some others, what part of “Go right round the monument” didn’t you understand? Note to the organisers: Mustangs are quite low (I know they know this) and you can’t see the same things from them as you can from a bread van, eg Manfield hoardings as viewed over the back fence! More cruising (or galloping as it was possible to do in one spot) along picturesque, near-deserted country roads got more questions answered (now we all know how many times Feilding has won the “Most Beautiful Town” contest and that the organic granary has 7 silos) and a few more playing cards picked up. One card stop was the Ohakea way-station – a very strange feeling for some, voluntarily approaching an officer of the law – and a very nice bloke he was too. Eventually, and I mean eventually in some cases (if taking so long meant you were being thorough, as Dale and Mike claimed, how come they didn’t win anything?) we all arrived at the Bulls Bridge Café for lunch and the club meeting. Fines were handed out, some grossly unfair (as usual) – yours truly and partner got fined for sporting Holden stick-on tattoos, mementos from Pukekohe the previous weekend. There I was thinking this is a Mustang club, not a Ford one! Prizes for the day’s activities were then awarded: the Bettridge family had the top poker hand (triple 7s) and got a trophy for that. Apparently young Mason had been complaining to his Mum that he kept getting the same card! David and Lynette Hunter won a trophy for being best scavengers (perhaps I should rephrase that) and Rhonda and Phil Goodin won the overall rally trophy. Those who didn’t win anything didn’t leave empty-handed, though; we all got to keep our bags of rubbish! Start point, Palm North Railway Stn, and finish point at the Bridge Cafe, Bulls. About 20 cars assembled on the Nikau Valley turn-off at Paraparaumu, and then headed over the hill to see the Lyndoe's 1971 Sportsroof restoration project. The car was a partly assembled shell, with painting just completed, and at 17 years to get that far, must be one of the longest restoration projects Ive heard of! A huge amount of work had gone into rust removal, but with all the major mechanical assemblies now rebuilt all that remains is to bolt it all back together again. Also at the Lyndoe's was a rare De Loren which was a most interesting vehicle to have a look over. Spares and even new body panels apparently CAN be still obtained! Next was a drive back over the hill and into the suburban depths of Paraparaumu to Mike Hampton's place, where his 67 convertible restoration was in progress. The car was stripped to a bare shell and was mounted on a rotisserie. How nice to be able to roll an entire car over to work on the underside without crawling around on the garage floor! It was interesting to see first hand the extra structural stiffening that is incorporated into the convertible's as compared with a fastback or coup. After the meeting a few of us drove a few hundred metres down the road to John and Chris's emu farm. 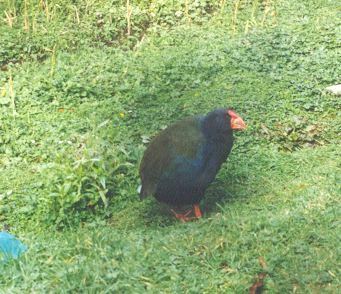 My son was fascinated by these birds and dad was amazed by the large size and colour of the eggs they produce. A lovely shade of metallic green. I was at first quite convinced they had all been painted! One emu egg = a 10 hens egg omelette! Chris says they taste much the same as a hens egg. Another really enjoyable day out. What a great bunch of people we have in our club! Hope to see you at convention on Hamilton next month. PS did anyone take an pics of this event that they want to share?? 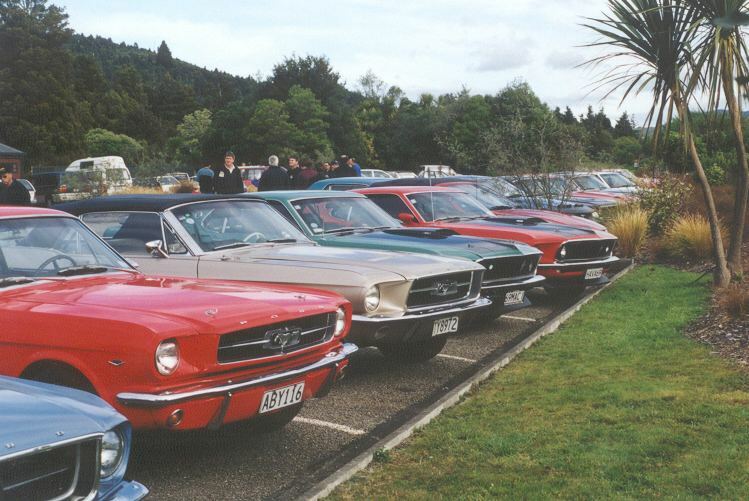 The club doesn’t often meet in Wellington because it’s hard to find a safe place to park a score or so of Mustangs. Boy, did we find a good place to park ‘em this month…in the grounds of Parliament buildings, no less – security guaranteed. Bad weather had us thinking not many people would turn up but 20 Mustangs and half a dozen other cars whose owners’ Mustangs leaked or wouldn’t start (yes, occasionally it happens) arrived. Over 50 people enjoyed a guided tour through Parliament, from the basement earthquake-proofing separators to the lovely Maori select committee room to the debating chamber itself. The décor has to be seen to be believed – old kauri doors; beautiful leadlight windows, domes and ceiling panels; library floor tiles re-made to the original designs (a fire during refurbishment having caused terrible damage); a huge array of ornate plaster-work done by overseas craftsmen and local artworks of breathtaking scale. It was fabulous, and you couldn’t help but ponder the vast sums of money that must have gone into the restorations. Imagine how many Mustangs could have been restored instead. Across the road we viewed artworks of a different nature – the caricatures of the rich, famous and sporty adorning the Backbencher Pub and Café. After lunch it was back to the cars for a serious photo session (it’s not often you can get a shot of your Mustang in front of the Beehive) and then set off to convoy round the outskirts of the city. By this time the weather was typically Wellington-fabulous and a very pleasant trip round the bays ended with a coffee at The Bach on the sparkling south coast. As far as we could tell, no one got lost; no mean feat considering the number of traffic lights and vans that sometimes held sections of the convoy up. The July meeting was a car leg-stretch (for most of those attending) to Dannevirke. Prayers about rain were mostly answered as a convoy of 8 cars left Wellington. We were about to pick up several more in Masterton when the newest member’s front spoiler let itself down. A few well-placed spanners later and Big Red was back on the road. It was agreed that the value of belonging to a club really shows itself when something like that happens – everyone helps; we’re all aware that 30-plus year old cars do have the odd problem on the road. 18 cars met at Burglar Bill’s Bistro at Matamua, a few kilometres east of Dannevirke. Burglar Bill’s is fascinating – full of motorbike and truck photos and memorabilia which includes several actual motorbikes! They do a very tasty cheeseburger and made us all feel very welcome. Next stop was Dannevirke’s Fantasy Cave (you never know where you’re going to end up with this club! ), which is full of childhood and fantasy displays and models, all made by volunteers. Both adults and children really enjoyed it and the train sets caused a couple of blokes to go all misty-eyed with nostalgia. After the Fantasy Cave we had the choice of seeing the Dave’s Den model car collection, visiting Bill’s wrecking/junkyard or going to Norsewood. There was a bit of good-natured yelling, along the lines of, “You said you didn’t want to go to the junkyard,” (amazing how blokes set each other off, innit?) and fighting over carkeys …with the natural consequence that most of the blokes set off for the junkyard and another group consisting of women and men who needed socks went to Norsewood, where we bought up large at Norsewear and sampled the village café’s yummy Devonshire teas. The group that went to Bill’s had a great time fossicking around, discovering the remains of cars (old to new, including ten MK3 Zephyrs in various stages of disrepair), lawnmowers, diggers, tractors, rollers - all covered in lichen - not to mention the models and bits and pieces that “might come in handy one day”, all salvaged by Bill in his 50 years of collecting. Some stopped in Carterton for a meal on the long trip home (but who really minds driving for hours in a Mustang?) and Big Red decided to cause more trouble and stop, in the rain, at the top of the Rimutakas. That’s one way of making your owner get you a new set of points! Another fantastic event with an excellent turnout. Wellington members met in Upper Hutt and convoyed in brilliant sunshine, over the Rimutaka Hill road and onto Masterton and Mt Bruce. The 10.30 am turn-out in the car park at the Mt Bruce Bird Sanctuary was an excellent line up of 23 cars. There was literally standing room only for the formal part of the meeting held in the Mt Bruce Theatrette. There was also a good turn-out of families and kids which was particularly pleasing to see. Sheriff Avon dished out a few well deserved fines, but as sheriff, declared himself immune from all future fines.. (yeah right Avon we'll see about that!) Craig Oldfield and Pam Hatchard should have got fined for turning up on a Harley (which later magically turned back into a 2001 Cobra with fancy new chromed mags! ), and Wal Marshall will doubtless be the recipient of a future sheriff's fine for leaving his car keys dangling in his car door! And everyone was amazed that Ron Dewsnap DIDN'T get a fine...and didn't even leave his blinker going even once after passing cars on the drive over from Wellington! Formalities completed, members wandered around the Bird Sanctuary, and grabbed some lunch in the cafe before meeting again in the car park. Poor Dale Such was pondering his bad luck (and chances of making it home) because his newly rebuilt and immaculate convertible was seriously leaking burnt smelling auto transmission fluid. 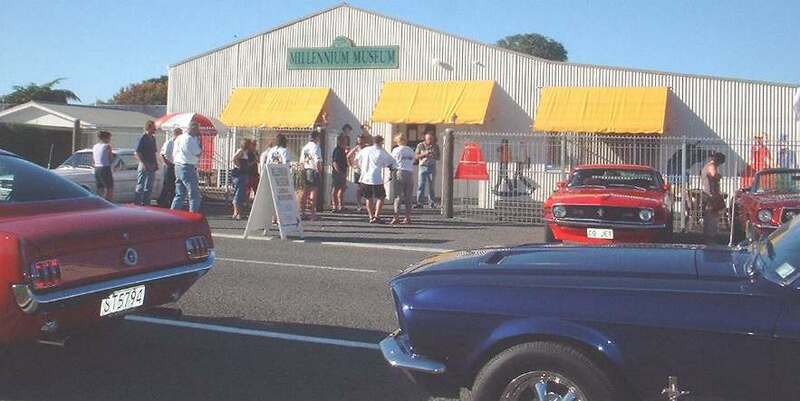 Mike Hampton commented that his big block Shelby had gulped down $40 worth of gas just coming over from Paraparaumu, and he wasn't sure there was even enough left in the tank to get back to Masterton. It was decided to complete the day by driving south to the Pointon Car Museum near Masterton, then south again to the Gladstone Country pub for a few drinkies and afternoon tea. It was during this run that part of the convoy was raked by a cop car radar travelling in the opposite direction. We all watched in trepidation as the cop braked hard, did a sharp U-turn and with lights flashing nailed poor James who had been hiking along at the tail of the convoy at 122 kph. He is now the lucky recipient of a $170 instant fine. (Me? I was second in the column but only 108 kph..whew!). So as members gathered together again at the very pleasant garden bar at the Gladstone Country Inn, James's story was retold. A very pleasant social time was had by all, including the kids who had a good run around, before everyone gradually departed for home again. A fantastic event – we were invited to join the National Street Rod Association on a “Charity cruise food-raiser” for American, British and Australian cars, held at Woodlands Lodge. The charity was Feilding’s Nassus Animal Shelter, so the price of admission was a large tin of petfood. In warm, calm (yes, calm in Sanson! ), perfect cruising weather dozens of cars crammed into Woodlands. The brilliantly-organised, activity-filled day included a treasure hunt, on foot, through the streets of Bulls. The kids had a ball (made a nice change for them from being cooped up in the back of a coupe) and several adults were also caught enjoying the hunt. Part of it was a quiz with no questions at all about Mustangs (H. Ford’s birthdate hardly counts) and nearly all the answers being years way before most of us were born! Then it was back to Woodlands for a flamethrower demo and our club “meeting” then off again to Ohakea for a 2 track grasskhana on exceptionally slippery clover. You could either have fun and do a good time, or have even more fun but take twice as long to get round the course – hard to choose! Many sponsors supported this event, so there were many prizes – it seemed that all the attending kids went home with something, as did many adults. The ‘Charity Choice’ car wasn’t a Mustang (ah well), but a very smart black Chevy, which several Mustang owners had been admiring anyway. The Nassus Animal Shelter people were thrilled with the support, not to mention the truckload of petfood, and many SH1 travellers got to enjoy a free classic car show. Not MMOC Event, but organised by Capital Rodders Association. Three MMOC members attended and participated in this Upper Hutt Event; Avon Compton, Kevin Golding and Ron Dewsnap. 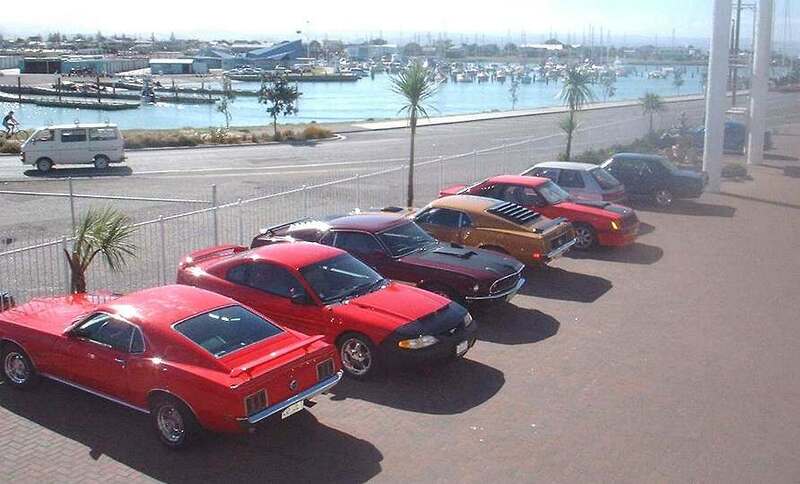 After the museum visit (pic's 2,3,4), the club drove back towards Napier for a evening BBQ at BJ's brother's lovely place, .near Pakowhai...and a enormous thanks to them for successfully feeding the ravenous bunch of Mustangers that descended on their quiet rural street! 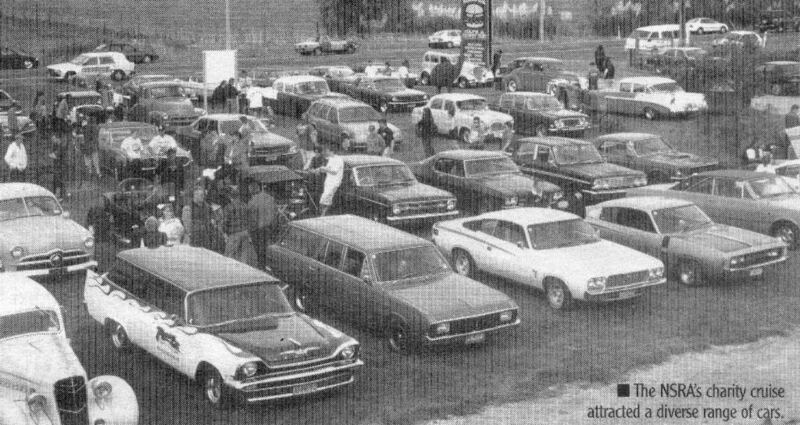 Next day (Sunday), the Anchorage Motor Lodge crowd descended on a local cafe for breakfast (pic 6), before heading back to BJ's, and onto the British car museum (pic 8). After the museum it was out to the coast again, for an enjoyable lunch at the Clifton Cafe. (Pic 9) . For the out-of-towners, there just remained the joy of the drive home in lovely sunny weather to complete a really fabulous weekend. It's becoming a tradition for the club to attend this event; this year 19 of our Mustangs parked under the trees at Trentham racecourse. In weather that went from cool to glorious we had a great time checking out and chatting to the owners of dozens of American V8s. There were Chevys, Plymouths, De Sotos, Buicks, Dodges, other Fords, including even more Mustangs...and they all sounded and looked fabulous. Event report and photos by James O'Regan. Thirteen cars arrived at memorial park after meeting on the main highway for a informal talk and to let the locals, and people passing through, know that there were mustangs in town for the day. With the weather turning for the worse at lunch time, barbeque and people had to take shelter under the trees. After lunch, the rain cleared, although the wind stayed, making it a little cold, but we were able to run the games and the quiz. The photos below show the cars that attended, lunch , and partaking in the games. Mens: Keith Robinson. Women: Sue Bettridge. Overall winners of games & quiz: Keith Robinson & Charmaine Scott. 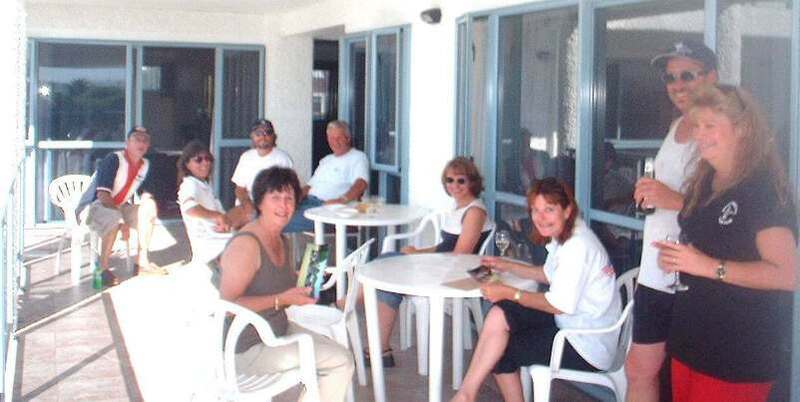 After the games, most members adjourned to the Top Hotel for coffee/fellowship, departing for home about 4.00pm.